Co-founders of the start-up ACSYNAM, Inc., a spin-off venture from the McGill University Department of Chemistry, have been selected as one of the ten incredible semi-finalists to compete for a €100,000 prize in the 2016 Skolar Award competition. Dr. Cristina Mottillo, post-doctoral researcher and CSO of ACSYNAM, Inc., will be representing the team by presenting a three-minute science pitch to a panel of judges and an audience from non-scientific backgrounds. The team’s start-up focuses on redesigning the synthesis of porous materials called metal-organic frameworks (MOFs) by using supercritical carbon dioxide as a green, non-toxic, and recyclable solvent. The Skolar Award is part of the Science Track at the Slush 2016 startup event, which takes place annually in Helsinki and this year will be held November 30-December 1, 2016. Slush is an international event bringing together startups, entrepreneurs, investors, and scientists to network and compete for monetary prizes. The Skolar Award is open to post-docs within five years of obtaining their PhD. The competition aims to encourage the pursuit of groundbreaking scientific proposals, and is designed to bridge the gap between academia and business. 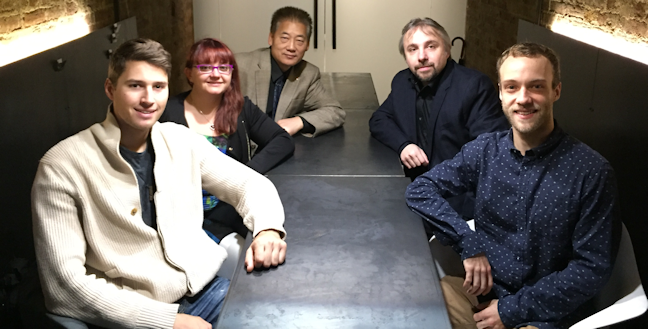 Caption: The co-founders of ACSYNAM, Inc. from left to right: Christopher Nickels, Dr. Cristina Mottillo, Dr. CJ Li, Dr. Tomislav Friščić, and Simon Girard.